Major Donations to Improve Hospital Infrastructure | McWane, Inc.
Amerex Corporation, a subsidiary of McWane, Inc. located in Trussville, Alabama, and World Dryer Corporation located in Berkley, Illinois, made major contributions to Hôpital Sacré Coeur, a hospital located in Milot, Haiti, to help improve hospital conditions. An excerpt from the article posted to The Center for the Rural Development of Milot’s website that details Amerex’s contribution is featured below. Hôpital Sacré Coeur is located in Milot, a town with a population of some 20,000 and the site of Haiti’s most popular tourist attraction. But there is no fire department in Milot – the closest one is nearly 20 miles away in Cap-Haitien, Haiti’s second largest city. The problem is that Cap-Haitien’s firefighting equipment is largely non-functioning. The only apparatus that works is located at the airport and this cannot leave the airport without permission from officials in Port-au-Prince. So Hôpital Sacré Coeur is on its own in terms of fire suppression. Accordingly, a major effort has been underway at Hôpital Sacré Coeur to improve our fire safety/fire control capabilities. Over the course of the last six months, 30 new handheld fire extinguishers have been deployed across the campus along with smoke detectors. And thanks to the generosity of C. Philip McWane, the chairman and chief executive officer of McWane, Inc., two 300 lbs Amerex wheeled fire extinguisher will arrive on the campus in early February. 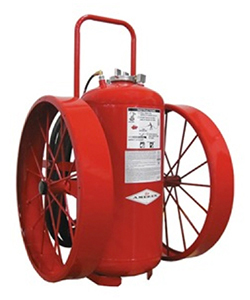 Amerex Corporation, a subsidiary of McWane, Inc., makes top-of-the-line fire suppression equipment. One 300 lbs unit will be located at the hospital and the other at the General Services annex. Without Mr. McWane’s kindness, CRUDEM would have had to spend more than $7,000 to purchase these two extinguishers. Mr. McWane’s generosity will help to make Hôpital Sacré Coeur a safer place – a much safer place – and we are very grateful to him and his colleagues at McWane, Inc./Amerex Corporation for their gift to the hospital. McWane is proud to have been able to assist those in need and we hope that our contributions really help make a difference for Hôpital Sacré Coeur. This is definitely the McWane Way! CRUDEM was founded in 1968 by the Brothers of the Sacred Heart of the Montreal Province. This organization has built roads, schools, wells, several co-operative ventures, and most significantly, a hospital to satisfy the needs of residents of the town of Milot, Haiti. To learn more about CRUDEM, visit their website. Posted on April 3, 2014, in Community Involvement & Giving and tagged Alabama, Amerex, Berkley, Haiti, Hôpital Sacré Coeur, Illinois, McWane, Milot, Trussville, World Dryer Corporation. Bookmark the permalink. Comments Off on Major Donations to Improve Hospital Infrastructure.